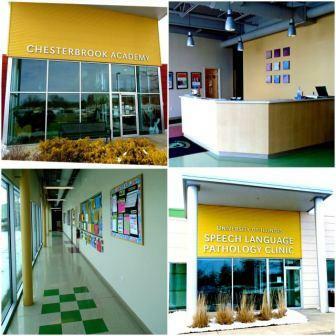 The 13,027 square foot Chesterbrook Academy preschool, located at 2001 South Oak Street, Champaign, opened in August 2007. With a capacity of 182, it accommodates children of Research Park employees as well as those of university faculty and staff, and the general public. In addition to serving infants from the age of six weeks to children up to the age of five during the school day, the academy also offers after-school and summer programs for school-age children. It employs the Nobel Learning Communities pre-school curriculum, Links to Learning, an integrated curriculum which incorporates the most up-to-date scientific research on the developing brain. The University of Illinois Department of Speech and Hearing Science’s Speech-Language Pathology Clinic is also located at 2001 South Oak Street, in a dedicated 3,705 square feet. It serves both children and adults, offering a full range of diagnostic and therapeutic services. Individual and group therapy is provided in large measure by graduate students, under the supervision of an American Speech-Language-Hearing Association Certified Speech-Language Pathologist (CCC-SLP). In addition, the state-of-the-art facility provides best practice in speech-language therapy for children and adults through the creation of naturalistic environments, a cutting-edge technology which includes video monitoring and a multi-sensory room for inter-disciplinary study.